Green describes a coarse actor as one who can remember his lines, but not the order in which they come. Often the scenery will fall down. Invariably his tights will fall down. Ages can vary from young to the practically senile. The three plays are presented as parodies of dramatic styles, in the performance of which everything which can conceivably go wrong in a production does, but the Coarse Actors struggle gamefully on throughout. "Skilful actors contrive hash performances"
With great ability, ten Garrick members, in their Lauriston Studio, demonstrate how not to act - cleverly pretending to be dumb yet using great skill in doing so. Each take turns to play the leads but since the programme doesn?t say who plays what, I can only say that all are equally proficient. 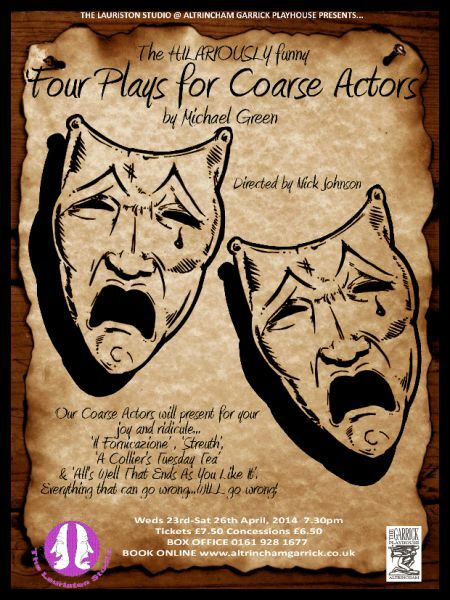 A parody of disorganised amateurs, this comedy stems from Michael Green?s 1964 book, The Art of Course Acting. In it, he says a course actor is one who can remember lines but not the order in which they come! ?His hope is to be dead by Act II so he can spend the rest of his time in the bar.? The collapsing of scenery, and failure of lighting and sound systems are well illustrated in each of four productions, the first of which is a take on D. H. Lawrence, A Collier?s Tuesday Tea. It is a comical presentation of working class family life. The tea table dominates the scene with all the misplaced humour occurring around it. Then comes Il Fornicazione, AKA The Adulterer. The singers struggle to perform when their orchestra doesn?t arrive and they are accompanied by a sole triangle virtuoso. A fornicating Countess Formaggio is appropriately exaggerated. When a poisoned pie appears it leads to an unforgettable scene where caricatures of a male chorus romp around singing whilst three people die melodramatic deaths. Next comes an Agatha Christie spoof. Streuth stars a nightmare of a detective who makes one incompetent move after another. The people he questions are comic cuts of Agatha Christie suspects. This time a body is there from the start. All ends comparatively well with All?s Well that Ends As You Like It, a take on Shakespeare. In it, a wicked Duke, has a stuffed bird fastened to his wrist. It?s performed at break neck speed and, as is typical of the bard, people switch sexes. I especially like the male fairy with the expressive face. 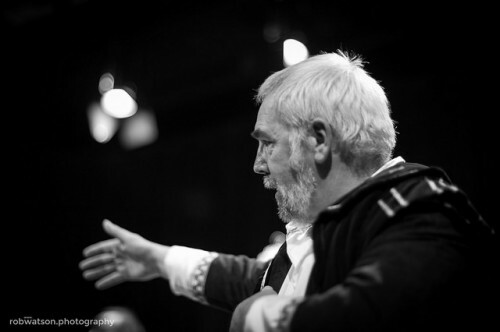 The show is held together by director Nick Johnson who apes the local vicar introducing the plays. He, too, gets laughs from what is an evening full of laughter.